Strawberry Chic: A Giveaway . . . from HeyYoYo! A Giveaway . . . from HeyYoYo! Amanda from HeyYoYo earned her diploma from The Culinary Institute of America in pastry, but developed her love of all things crafty while working for Martha Stewart Television as a recipe developer. HeyYoYo sells a variety of party products like baking supplies, novelties, decorative bags, & much more! 1st. Visit HeyYoYo and browse through Amanda's lovely party products. 3rd. 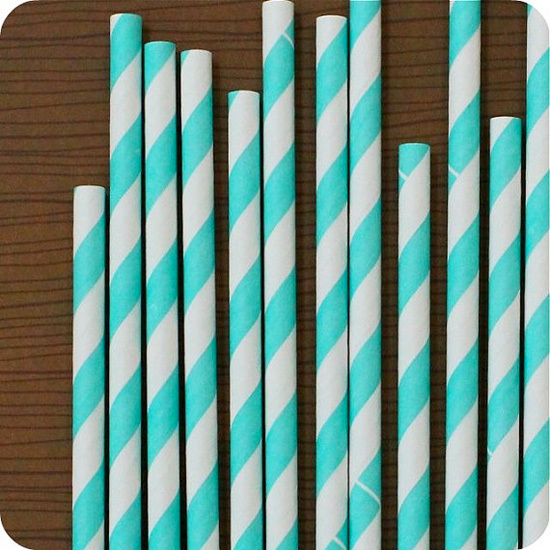 Leave a comment telling me what you plan to do with these straws. For example...use in a favorite party beverage, make them into mustache holders, or make some belated sparkler straws! The Giveaway will end THIS SATURDAY the 16th and the winner will be announced next Monday the 18th. For an additional entry go to my Facebook page and "like" StrawberryChic. p.s. I'm doing a giveaway today too...happy Monday! Fun! Thanks for hosting the giveaway! I'd probably use the straws for cupcakes :) a little accent. I'm also a "liker" on FB! Those straws would be so cute in a glass of milk with a cookie party. Could even use them with Cake pops! I am a follower and also "like" you on facebook! Love HeyYoYo's Green Apple Divine Twine! So cute! They would be perfect for a baby shower I'm helping to throw in a few weeks. I'm a facebook fan as well! THe cool pickle bags are pretty cute! I want to use the straws for chocolate milk, because that's my favorite thing to drink out of a straw ;) love hey yoyo stuff! I love these straws! And they would look perfect in the glass bottles I've been collecting for a party. i love these straws and would love to use them at my daughters 2nd birthday party in aug.
i love these and have wanted them forever! perfect for our next bbq! I like Strawberry Chic on Facebook! Wow ! what an amazing blog.Its one of the best blog I have ever read. ahh I have been wanting striped straws for SO long! I would use them for a pick-me-up when I am having a bad day :) Plus put them in drinks when I post recipes on my blog! I am already a follower of Strawberry Chic through GFC. And along with all of her great straws, I love HeyYoYo's adorable cupcake liners! And I also like Strawberry Chic on facebook! I love, love, LOVE these aqua straws they are the cutest things ever!!! I have been over to Hey Yo Yo's site, lots of fun must haves. I am now a follower and like you on facebook!! If I were to win these straws I would use them in my kids fruit smoothies and frozen hot chocolate. How cute would that be??!! I loved your store! I could use the straws for this October when we celebrate my daughter's 21st birthday (she has William's syndrome). She loves Yogurtland, so we decided to have an ice cream/yogurt theme. I'm planning the photo ops with some big ice cream theme cuts and I can glue them to these straws. The colors are pink, green, light turquoise, and light orange! Emree's birthday is only 4 months away! These would be adorable in the refreshments. Oh love these! I would deffinately use them at a party. Maybe a welcome baby party! wow! how did I miss this...they look fabulous!!! I'm a new follower and I would use these in the watermelon margaritas I'm fixing tonight if I had them! Thanks for the giveaway! I am a new follower, via Pinterest, and I would use these for my daughter's birthday party. Such a great giveaway! The best blog i have ever read. Nice blog on Baking Supply.